I didn’t always want to be a writer. Actually, that’s not true. I didn’t always know that I wanted to be a writer. Growing up in a fairly religious household (staunch is, perhaps, the more apt word) and possessing a natural talent for the piano, I was encouraged to use my gift for the ‘Glory of God.’ So, I did … use my ‘gift,’ and spent my childhood and adolescence playing in church. And much to the dismay of the church elders! When I sat down at the piano, I could almost hear their moans and groans of disapproval before my fingers touched the keys. I had a penchant for doing the unthinkable: rearranging classic hymns like ‘How Great Thou Art,’ ‘Amazing Grace’ or ‘There’s Power in the Blood.’ I was doing something that — to my parents’ chagrin — came naturally to me. I was breaking the rules. Although music dominated my formative years, I was a closeted writer. I wrote stories in notebooks and journals, which I hid under my bed. 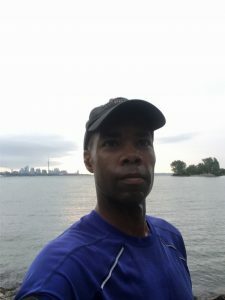 Returning to Canada after studying for eight months in Nice, France, that was when I realized writing — more than music — was my passion. And I gave myself over to it. I quickly discovered that writing is a messy affair and that the road to success is paved with many obstacles (and rejection letters) along the way. But I wouldn’t be dissuaded. Despite how daunting the writing life could be, I knew it was my calling. And I had to heed the call. So, I wasn’t surprised when, in the early part of 2005, I sat down and wrote a story about rules that mirrored my own life. My late teens to early twenties were turbulent years, and I needed rules to govern my daily life and to ground me. Those rules were … unbreakable. And that story, published in September 2005 and entitled, “Malachi and Cole,” later became my first published novel, Freestyle Love. When Freestyle Love hit the electronic bookstores in 2011, I hoped for a bestseller. That didn’t happen. And that disappointed. I thought I’d written a good book. After all, I’d worked hard on the manuscript — editing, reediting and editing some more. The publisher told me they loved the story and asked for very few changes. The reviews — some good, some (many) not so good — had me doubting my talent as a writer. The book limped to a slow death, and was pulled from online when the rights reverted back to me five years later. During those five years I kept writing, working to hone my skills. I read books on writing to find anything of value to help me become a better writer. I had also written another novel, and began researching what it would take to self-publish. 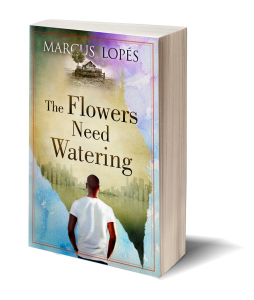 So, I decided to go the self-publishing route with The Flowers Need Watering, which is available on Amazon. I learned a hard lesson with Freestyle Love, one that I wouldn’t repeat with The Flowers Need Watering: the importance of a professional editor. In reviewing the manuscript for The Flowers Need Watering, my editor hit on all the big-ticket items — character and plot development, structure, continuity, story arc, theme development, repetition and plot holes. He didn’t only point out what wasn’t working, but also what worked well. Through that process I realized something else. Maybe Freestyle Love, despite what I thought at the time, wasn’t my best effort. Now I knew I could do better. So, I decided to try. 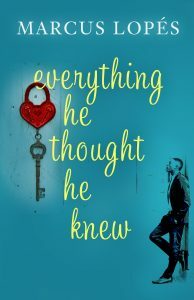 Everything He Thought He Knew is a complete rewrite of Freestyle Love that has been through two rounds of vigorous editing by Dave Taylor of thEditors.com. I am eternally grateful for his insights and wisdom. Throughout my writing journey, I’ve often felt ‘caught’ (Caught was the original title of Freestyle Love before publication) between the life expected of me and the one I imagined. Malachi Bishop and Cole Malcolm may or may not be caught by something more sinister: the idea of true love and its sure path. Malachi, a writer and professor of creative writing, is a rigid — even awful — man paralyzed by a long-held grief knotted around his heart. He is, perhaps, not the most likeable protagonist, but it’s my sincere hope that he is a real one. Cole, a successful management consultant, is older and unafraid of the things that love is all about. Everything He Thought He Knew tells a story of two men caught by love and betrayed by it. It is a journey of self-discovery that forces Malachi and Cole to confront their present and their past, bringing into question the larger fantasies of home and their place in the world. Everything He Thought He Knew doesn’t guarantee the normative happily ever after ending of the romance genre. My hope is that it transcends it. Available on October 10, 2018, you can read the first chapter or pre-order your copy of Everything He Thought He Knew here. 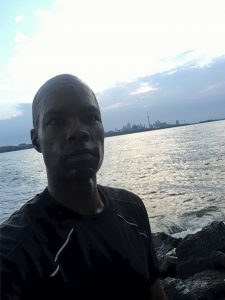 Out for a morning run, I stopped to take in the spectacular view of Toronto. Slow and steady … that’s how I managed to run 15 kilometres this morning. There were times during the run when it hurt, when I felt like I wanted to give up. But I knew if I kept my pace slow and steady that I could go the distance. For the past few months, I’ve been thinking about my life — where I’ve been, where I am, and where I’m still looking to go. Maybe that’s what you do when the years tick by and, as my 45th birthday looms, the end seems closer than the beginning. But there have been many times throughout my life where I’ve taken time to stop and reflect, to figure out what exactly I’m doing and if I’m on track. I am a writer. That is true. I know that because every day I write no matter where I find myself in the world — London, Copenhagen or at home in Toronto. Writing is what grounds me, gives me a sense of purpose in what sometimes feels like a chaotic world. And some days are a struggle. A struggle, yes, because I’m really not sure how to define success when it comes to my writing. It’s hard for me to visualize what that success looks like. Is success about becoming a New York Times bestselling author? Is success hitting a target of, say, selling 80,000 copies of my books? (Can you tell I recently read How I Sold 80,000 Books by Alinka Rutkowska?) Is success about me making enough money from my writing to commit to it full-time? Maybe it’s all those things and more. Or less. For the past week, I’ve taken time daily to reflect on my journey so far, and to grapple with the idea that a principle-based life will help me figure out what I want and how to go about getting it. Subliminally, certain principles have always governed my life — be true to yourself, focus on what matters, think independently, don’t follow the crowd, etc. But now I want to dig deeper as I’m really thinking about what I want my life to represent. The first thing I had to do was look at the reality before me and find a way to deal with it.2 The reality before me is this: I feel stuck in a job that I’m not passionate about, but it gives me 13 days off a month. On the surface, that looks pretty good, having so much time off. But the demands of the job leave me exhausted, disrupt my sleep patterns, make me more prone to illness and, consequently, impact my productivity when it comes to writing. 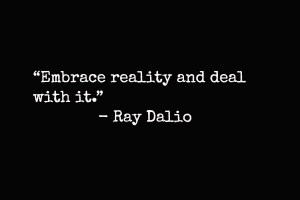 That’s also part of the reality. So, the puzzle I’m currently trying to solve is how to live fully in this reality and create an acceptable balance. Writing each day moves me in the direction of my dreams. Remaining positive about what I can do — and not letting myself be overwhelmed or disappointed by the things that are beyond my control — help to keep it all in perspective. I’m doing what I can, with the time that I have, to do what I want and stay focused on what matters most. And again, taking it slow and steady, I know I’ll reach the final destination. Taking time to think about the principles in my life is uncomfortable because it’s forcing me to see both my weaknesses and my strengths. It’s forcing me to admit where I’ve made mistakes and how to avoid making them again in the future. It’s forcing me to see the world — and my life — not as I believe it “should” be but how it really is. Like I pushed myself this morning to keep running, I’m pushing myself in life to grow, to be stronger … to be a better version of myself. 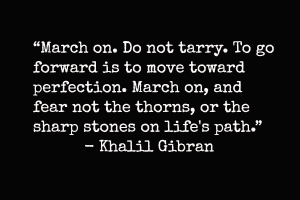 I know this process won’t be easy, and some days it’s going to make me squirm, but I’ll keep pushing forward. I know it’s the only way for me to be successful and to get out of life all that I want. And whether I succeed or fail, I know the journey will teach me more about who I am and what I really want. Where are you now on your journey? What’s working for you and what’s holding you back? Let me know in the comments section below.